In a shocking discovery, astronomers have found a galaxy that is missing most -- if not all -- of its dark matter. This discovery of the galaxy NGC 1052-DF2, detailed in the journal Nature, challenges currently-accepted theories of and galaxy formation and provides new insights into the nature of dark matter. "Dark matter is conventionally believed to be an integral part of all galaxies -- the glue that holds them together and the underlying scaffolding upon which they are built," explained study co-author Allison Merritt from Yale University in the US and the Max Planck Institute for Astronomy, Germany. "This invisible, mysterious substance is by far the most dominant aspect of any galaxy. Finding a galaxy without any is completely unexpected; it challenges standard ideas of how galaxies work," said lead researcher Pieter van Dokkum of Yale University. "There is no theory that predicts these types of galaxies -- how you actually go about forming one of these things is completely unknown," Merritt said. For the study, the researchers used the NASA/European Space Agency's Hubble Space Telescope and several other observatories. Hubble helped to accurately confirm the distance of NGC 1052-DF2 to be 65 million light-years and determined its size and brightness. Based on these data the team discovered that the newly discovered galaxy is larger than the Milky Way, but contains about 250 times fewer stars, leading it to be classified as an ultra diffuse galaxy. "I spent an hour just staring at this image," van Dokkum said as he recalled first seeing the Hubble image of NGC 1052-DF2. "This thing is astonishing: a gigantic blob so sparse that you see the galaxies behind it. It is literally a see-through galaxy," he added. Further measurements of the dynamical properties of 10 globular clusters orbiting the galaxy allowed the team to infer an independent value of the galaxies mass. This mass is comparable to the mass of the stars in the galaxy, leading to the conclusion that NGC 1052-DF2 contains at least 400 times less dark matter than astronomers predict for a galaxy of its mass, and possibly none at all. This discovery is unpredicted by current theories on the distribution of dark matter and its influence on galaxy formation. 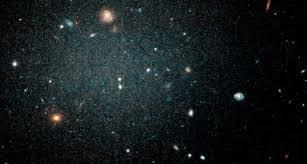 The discovery of NGC 1052-DF2 demonstrates that dark matter is somehow separable from galaxies. This is only expected if dark matter is bound to ordinary matter through nothing but gravity. Meanwhile, the researchers already have some ideas about how to explain the missing dark matter in NGC 1052-DF2. Did a cataclysmic event such as the birth of a multitude of massive stars sweep out all the gas and dark matter? Or did the growth of the nearby massive elliptical galaxy NGC 1052 billions of years ago play a role in NGC 1052-DF2's dark matter deficiency? These ideas, however, still do not explain how this galaxy formed. To find an explanation, the team is already hunting for more dark-matter deficient galaxies as they analyse Hubble images of 23 ultra-diffuse galaxies -- three of which appear to be similar to NGC 1052-DF2.